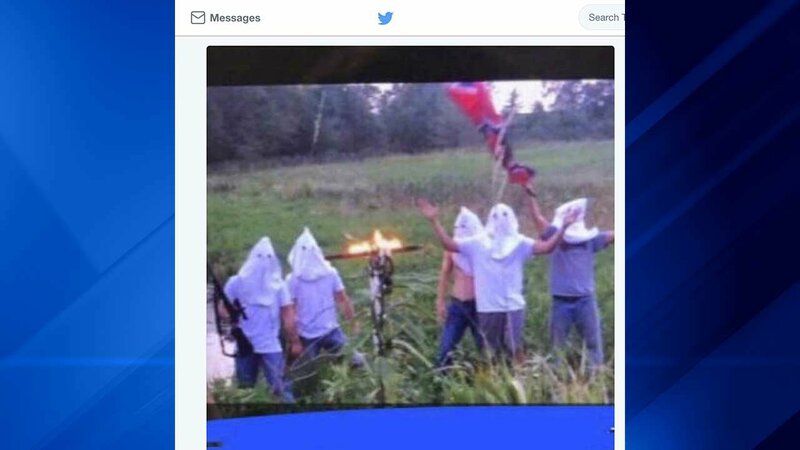 CRESTON, Iowa -- A southern Iowa high school said Wednesday it had disciplined several students who appeared in a photo on social media wearing white hoods and waving a Confederate flag next to a burning cross. At least one of the five people pictured is holding what appears to be a rifle. Creston Community High School Assistant Principal Jeff Bevins first told the Creston News Advertiser that the school became aware of the photo early Wednesday morning. Principal Bill Messerole told The Associated Press that the students involved have been disciplined, but would not say what that discipline entailed, citing the school's student confidentiality policy. Messerole said school officials met with the students, but declined to comment on what was discussed. He declined to say whether he had spoken to the students' parents or guardians. "I'm new to this," Messerole said when pressed for more information. "I haven't had any situations like this before." The photo, Messerole said, was not taken on school grounds. "Our investigation is ongoing," Messerole said. "I would say that picture does not reflect the values of Creston High School, our school district or our community whatsoever." Creston is a city of more than 7,800 about 70 miles (112.65 kilometers) south of Des Moines.